The School of Arts is hosting a new exhibition, Beyond the Barricade, in the Studio 3 Gallery in the Jarman Building from 28 September 2018. Based on the spirit of the French Revolution, the exhibition brings artists from various nations together to look at different dimensions of revolutions. By documenting past upheavals and recent events, the exhibition aims to present artistic creation as a form of social and political action. Beyond the Barricade has been supported by the nationally funded project, the Age of Revolution, in partnership with Waterloo 200. The exhibition will run until 30 November 2018. The Studio 3 Gallery is the School’s dedicated exhibition space which plays host to major exhibitions and annual shows that are open to the public. This entry was posted in Campus online, Student Guide and tagged Campus online, Canterbury, Student Guide on 21 September 2018 by Michelle Ulyatt. 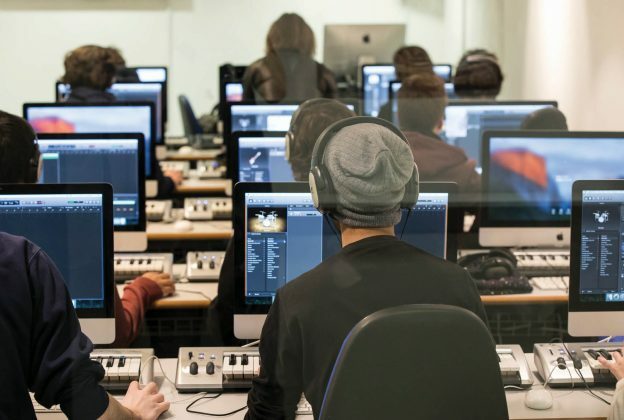 The University of Kent’s Centre for Music and Audio Technology has formed a Music Academic Partnership (MAP) with UK Music. MAP is a ground-breaking collaboration between a select number of educational institutions and UK Music, a campaigning and lobbying group which represents every part of the recorded and live music industry from artists, musicians, songwriters, composers, record labels, publishers, producers and music licensing groups. Academic members, who must be invited to become a part of MAP, benefit from this membership with a number of initiatives that include exclusive networking, collaborative research, a parliamentary programme, rehearsal spaces, and a range of student opportunities, including the BBC Introducing Pilot, MAP Music Technology Prize and access to exclusive Production Days and industry showcases. This partnership is the latest example of CMAT’s excellent links to the music industry and commitment to the employability of its students. CMAT works with leading music bodies across the industry, including the British Academy of Songwriters, Composers, and Authors (BASCA), the Music Managers Forum and the Council for Music Makers. This entry was posted in Campus online, Medway Student, Student Guide and tagged Campus online, Medway, Student Guide on 21 September 2018 by Michelle Ulyatt. 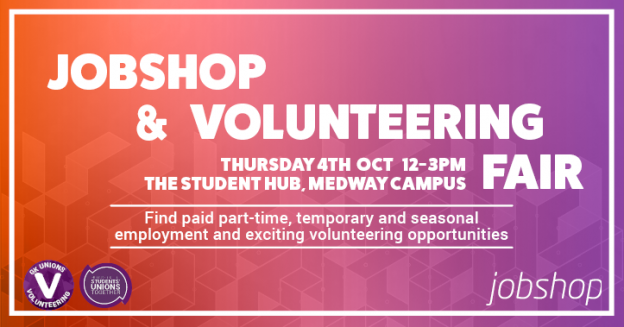 GK Unions is proud to announce the debut Jobshop and Volunteering Fair, which takes place on Thursday 4 October at the Student Hub, Medway campus. 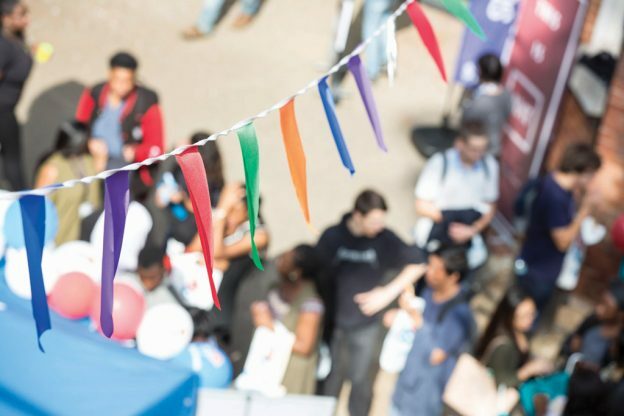 The fair gives you the chance to come and speak to a variety of organisations offering paid work and volunteering opportunities, from one-off projects on campus to long-term projects with community organisations and much more! It is organised by GK Unions, Jobshop and Volunteering. You can find out which community groups and employers will be attending at the event Facebook page. This entry was posted in Medway Student, Student Guide and tagged Medway, Student Guide on 21 September 2018 by Michelle Ulyatt. 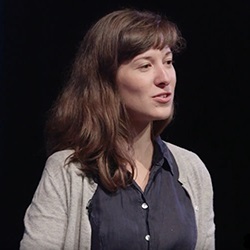 Dr Mathilde Poizat-Amar, Lecturer in French in the Department of Modern Languages, has given an online lecture entitled ‘Why is Travel Literature so Interesting?’ for the University’s Think Kent series, which is now available on YouTube. In a globalised and increasingly connected world where we can collect information about unknown places without having to open a book, travel literature could easily pass for an endangered species in the literary landscape. Yet, despite the concurrence of Internet and the ever-growing importance of major literary genres (such as the novel or the autobiography), travel literature stands the test of time – both in terms of popularity and critical importance. Mathilde’s talk takes the case of modern and contemporary French Travel Literature to present a few reasons why travel literature is so resilient to change, and why studying travel literature matters more than ever. You can watch the full talk on YouTube. The Think Kent lectures are a series of TED talk-style lectures produced with the intention of raising awareness of the research and teaching expertise of Kent academics and the international impact of their work. This entry was posted in Campus online, Medway Student, Student Guide and tagged Campus online, Canterbury, Medway, Student Guide on 21 September 2018 by Michelle Ulyatt. Kent Alumni BBQ – thank you! Thank you to all the alumni, students, and staff for attending the Kent Alumni BBQ last Friday at Dolche Vita. It was great a turnout and it was lovely to see everyone socialise and network. We hope you enjoyed all the food and drinks! Don’t forget to clear your evening on Tuesday 25 September at 18:00 and attend our Alumni Pub Night! Speaker will be announced soon. This will be a great opportunity to network with fellow alumni and current Kent students and catch up on the news from Kent. We will be at the Miller’s Arms in Canterbury. First drink and nibbles will be provided. To get involved in events like this, make sure your follow the Kent Alumni Facebook page or email N.Fleet@kent.ac.uk for more information on future events. This entry was posted in Campus online and tagged Canterbury, Medway on 28 August 2018 by Michelle Ulyatt. 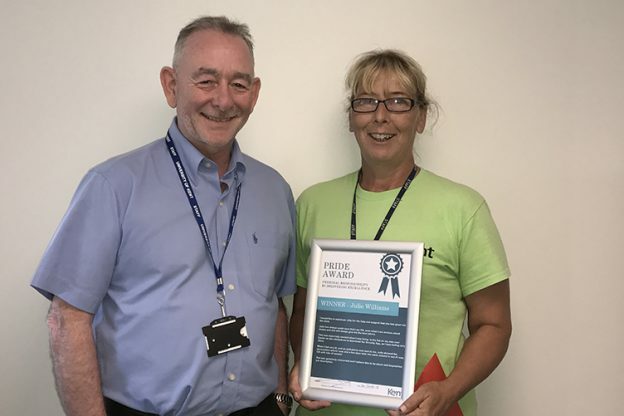 We are delighted to announce that the winner of the June Kent Hospitality PRIDE Award is Julie Williams, Turing College Domestic Assistant. The Personal Responsibility in Delivering Excellence Award recognized Julie’s caring personality while consistently providing additional support to residential students on the Canterbury campus. An extract from one of Julie’s nomination reads: ‘…she has always made sure that I am OK even when I am anxious about exams and she will always give me the best advice […] When I fell very ill, and an ambulance was sent to me, Julie showed the paramedics where I was and a few days later she came around to see if I was OK’. Any Kent Hospitality staff member (permanent or casual) may be nominated from Canterbury and Medway campuses. The award is given in March, June, September/October and December with each winner receiving £100 of shopping vouchers, a certificate and a Pride pin badge. It’s really easy to nominate a member of the Kent Hospitality team for a Pride Award. Just visit the Pride website and complete our online form. The closing date for the next Pride Award is Wednesday 26th September 2018 at 12 noon. This entry was posted in Campus online, Medway Student, People, Student Guide and tagged Campus online, Canterbury, Medway, Student Guide on 2 July 2018 by Michelle Ulyatt. The Student Success Project central team is delighted to announce that the Student Success Resources Toolkit (SStaRT) is now live. The toolkit is part of the Student Success Project’s mainstreaming programme. SStaRT will provide all schools with an opportunity to see what kind of initiatives from phase one and two of the Student Success Project might work with their students, what effort and costs are involved in getting them off the ground, and the lessons learned. It will also provide a space for schools and departments to share their initiatives, using a downloadable form, so that we can all benefit from each other’s experiences. 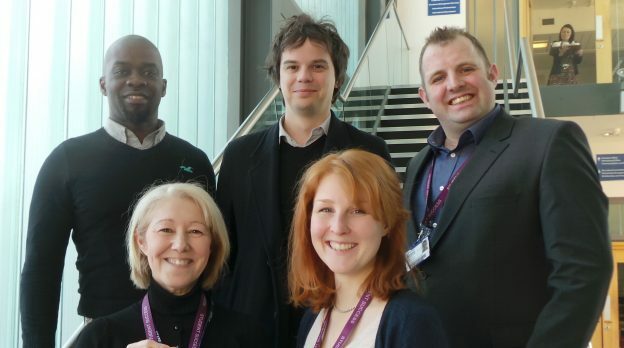 To share your thoughts and comments about the toolkit email studentsuccessproject@kent.ac.uk. This entry was posted in Campus online and tagged Campus online, Canterbury, Medway on 29 June 2018 by Michelle Ulyatt. 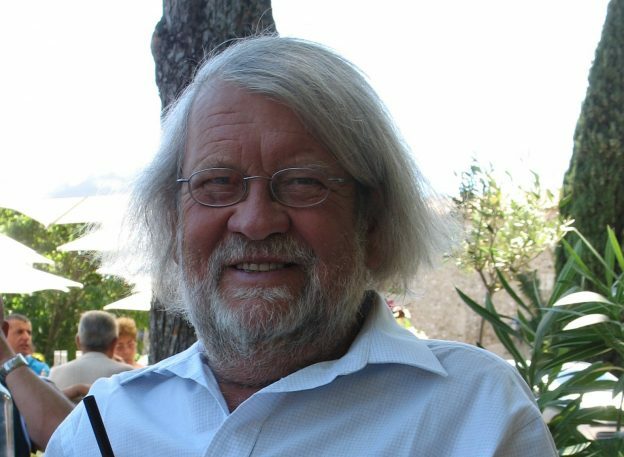 Former colleagues in the Law School and the wider University were saddened to learn of the death of Ian Grigg-Spall on Saturday 16 June 2018, one day short of his 75th birthday. Ian was one of the first lecturers in law at the University, joining what was then the Board of Studies in Law in 1969. He was a mainstay and influential member of what became the Law School, until his eventual retirement in 2007. In that time he played a major role in the development of the distinctive critical orientation of the Law School at Kent, especially in relation to Marxist approaches to law. He also developed radically new approaches to teaching and research in Company Law, working closely with Professor Paddy Ireland, with whom he also edited the Critical Lawyers Handbook. Ian was brought up in pre-independence Kenya, graduated with degrees from Cambridge and Harvard, where he was a Fulbright Scholar, and qualified as a solicitor with a city firm before joining Kent. He made frequent trips to Africa throughout his life, including a spell as a visiting academic at the University of Dar es Salaam. In later years at the Law School he focussed on promoting recruitment and very successfully expanded the School’s number of overseas students. This took him on many international trips to Africa and further afield, where he became a well-known figure on the international university recruitment circuit. Ian had an intensely political sense of the role of law and legal education, and is remembered by students as an inspiring and engaging teacher. He was instrumental in founding and steering the Critical Lawyers Group at Kent for students, which eventually became a national organisation holding regular conferences with major figures from the legal profession and academia. He was deeply committed to the transformative power of legal education and was one of a group of colleagues who shaped the Law School in a way which enabled it to become arguably the leading critical law school in the country. The funeral will be at Barham at 11.20 on Wednesday 4 July, followed by a wake at Boughton Golf Club. This entry was posted in Campus online and tagged Campus online, Canterbury on 21 June 2018 by Michelle Ulyatt. 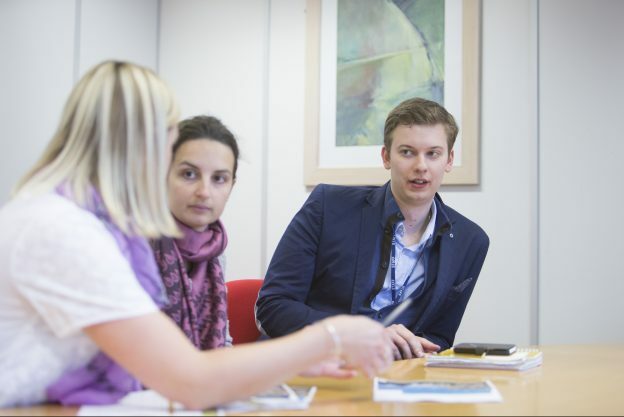 Learning and Development are running the next Central Staff Induction on Monday 9 July at our Canterbury campus. If you are a new member of staff and haven’t already attended an Induction event, please book your place by emailing the team at ldev@kent.ac.uk. 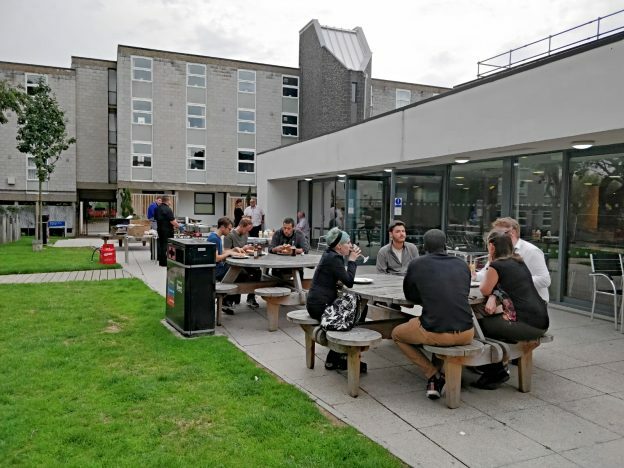 This entry was posted in Campus online and tagged Campus online, Canterbury, Medway on 15 June 2018 by Michelle Ulyatt. Learning and Organisational Development will be running a two-day Project Management training course on 23 and 24 July. Please make a booking via the Learning and Development activities calendar.